Bor is an Orc miner who lives and works in Narzulbur at Gloombound Mine. She spends her time mining the ebony ore there. 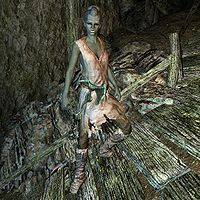 Like her fellow workers, Bor spends all her time inside Gloombound Mine, mining the ore inside. She may occasionally stop to relax, drink, or eat. Bor wears a set of ragged robes along with a matching pair of boots. She wields a leveled war axe which can be up to Orcish in quality and carries a pickaxe. This page was last modified on 25 July 2013, at 17:19.